For the last couple of months, I’ve been searching deeply, tirelessly, exhaustingly, for what’s next. And frankly, I’m just too damn impatient to wait any longer. I’ve been asking myself over and over and over: What drives me? What key themes emerge when I reflect on my strengths and experiences, and feedback from others I trust? And then, how do I want to spend the next chapter of my professional career? How do I want to consistently spend my time, energy and effort? Oh yeah, and what would people actually value enough to pay me for? My coach and I talked this week about the next chapter — and in regards to the time, energy and focus question what do I put in my bucket or jar. I always go back to people, and specifically helping leaders and their teams. For the longest time my personal mantra has been to: Inspire others to their greatness. As a leader and entrepreneur my mantra has been to: Make people’s lives awesome. A couple months ago I said to myself that I wanted to make an exponential impact. So I have gone around and around on what I might offer. I’ve read, sought feedback, tweaked ideas and drafted plans endlessly. Then last night, my wife Lindsey who has had a front row seat to all this endless exhausting soul-searching wandering and ranting (bless her heart!) said, essentially … why don’t you just put it out there … and talk about what you want to talk about. I want to talk about: You and Your People. I want to talk about the leader and their team. And share and discuss my personal experiences, growth, key lessons over the last 10+ years as a leader of teams — and what’s been the most impactful and helpful for me on the subject of leading myself and leading others. It’s going to be somewhat of a first draft. But also updating concepts I’ve shared in the past that have resonated within me, and also others. You have the opportunity to be a part of my beta group. I want to share … and ask questions. And I want others to ask questions and share too. The Habits of Reading and Writing — two key practices that got me here, and I trust to continue taking me farther and what I think are essential habits of leaders. Reading keeps you learning and growing as a leader and human, and it opens you up to new ideas that you can apply. Writing helps crystallizes your ideas, vision, beliefs and makes you a better communicator. If you don’t have a public blog or private journal, you’ll be starting one. The Iceberg — this is all about self-care and support for you, the leader. If you’re not healthy and taking care of yourself then your people will suffer greatly. You and your health are paramount to success for you and those you care about. Making People’s Lives Awesome — inspiring greatness in others by loving and caring for them as humans, and developing them through mentoring and coaching so that they are empowered and released to do and give their very best everyday at work and when they go home. Going Far Together — creating a sense of belonging and purpose that we are all much better together than separated. 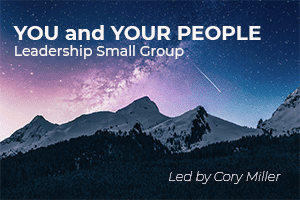 Developing and sharing a compelling vision of the future that inspires and connects your people and their contributions to your goals. This will be a small group, capped at 10 people. We will meet weekly for 1 hour for 5 weeks — on Thursdays at Noon Central, starting April 18, 2019. I’ll share for roughly 30 minutes … and leave around 30 minutes for discussion, Q&A that I will moderate. We’ll meet via Zoom … and the meeting will be recorded and shared afterward with those who are in our beta group. Have more questions? Post them in the comments below, or ping me privately here.